One topic I discuss on this blog is the tactics used by various advocacy groups to make misleading arguments in their efforts to advance their interests.There is, of course, a large anti-psychiatry contingent that argues that severe and chronic mental illnesses like schizophrenia and (real) bipolar disorder are not real brain diseases. They also argue that, since their brains are normal, the abilities of affected individuals to think rationally enough to properly take care of themselves are not highly impaired, so that involuntary commitment and treatment are never indicated under any circumstances. Of course, they seem to make a big exception for people who suffer from the brain disease of Alzheimer’s disease, but that’s another issue.It recently occurred to me that the argument I have been hearing from those who deny that climate change exists, or that people are contributing to it, is very similar to one that is used by the mental illness deniers. 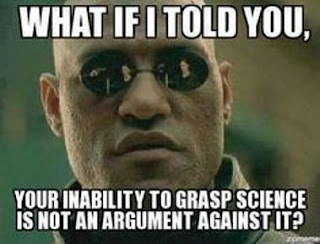 They knowingly set a bar for “proving” the nature of these phenomena that is totally unachievable by science, and then use this ridiculously high bar to assert that, since the science is not "proven," then it is invalid.In complex phenomena like weather or brain structure and function, the number of involved factors contributing to the final result is enormous, and their interactions unpredictable to a significant degree. Schizophrenia, for instance, is clearly not a disease of the gross pathology of the brain, which is what the deniers insist is necessary for “proof,” but is probably a disease of the interconnections between literally billions of nerve cell synapses that connect one neuron to others. We have no way currently to map out these connections in precise detail, and they change constantly over very short periods of time, so we cannot prove that they are pathological. There is, however, an astronomical amount of indirect evidence that they are.Similarly, climate change deniers use the fact that the various computer models which predict how the process will unfold differ from one another in their predictions about the exact timing and locations of various expected weather events as evidence that the science is completely flawed. What they completely omit to mention, of course, is that no one is arguing that we have or probably ever will have the ability to predict weather patterns with that degree of precision. They also conveniently forget to mention that all the models point in the same direction, and that the patterns are already happening in ways that are consistent with the more general predictions.Well, there are a lot of things that science cannot predict with absolute certainty, so we have to go with the preponderance of the evidence. In cases in which the consequences of inaction are enormous, we still have to act without this ridiculously high level of “proof.”I would argue that allowing the mentally ill to languish in jails or in cardboard boxes on the streets of cities like San Francisco is such an instance. So is climate change that can lead to mass population dislocations with resultant wars, severe pollution, starvation, and the spread of tropical diseases that might kill us all. I do not know if there is a name for this logical fallacy so glibly employed by science deniers. But there should be!